In a high-tech world, splashy and bold tropical house plants put us in touch with nature in a big way. Not really. Most common house plants originated in tropical or subtropical regions, growing under the canopies of tall trees, which makes them well-suited to living under the shade of a roof. And because tropical climates never dip below freezing temperatures, tropical house plants can thrive in our warm homes year-round. One thing indoor tropical plants likely won't have in our homes is high humidity -- but we can add that. 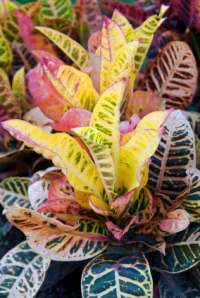 Brightly colored Croton Plants thrive beautifully in their native habitats of Malaysia, the Pacific Islands and Northern Australia. Provide the same bright light and high humidity and you'll make them feel right at home. Like many rain forest plants, crotons have slick, shiny leaves. Why? Tropical rain forests are wet. Really wet. Many regions average 100 inches of rain a year (some A LOT more!) and along with it, humidity levels around 80%. During the rainy season, tropical rainforest plants often get more moisture than they need, so their leaves have slick coatings to easily shrug off the rain. Broad leaves, handsomely marbled with white, have made Dumb Cane (Dieffenbachia maculata 'Tropic Snow') a favorite for decades. It's so familiar in our homes, it's difficult to imagine it growing wild in Brazil. 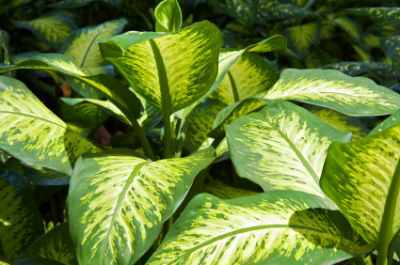 Despite its tropical beginnings, Dumb Cane adapts well to average humidity and light. Its low-maintenance lifestyle and boldly patterned leaves make it easy to live with. Forty percent humidity is considered "average" in most homes. Fortunately, that's a comfortable level for people and most houseplants. However, many tropical house plants grow best with sixty to seventy percent humidity. Short of turning a room into a misty rain forest, there are a few things you can do. Check out these easy tips for raising the humidity for your house plants. In the wild, you'll find bromeliads growing in the Central and South American rain forests where they make their homes on tree branches. Bromes grow in a rosette of stiff, upright leaves, forming a cup that serves as a reservoir to hold rainwater. One of the most popular of the species is Scarlet Star (Guzmania lingulata, pictured here). 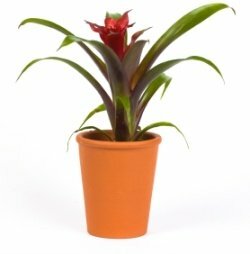 Because it's less demanding of high humidity than other bromeliads, it is easy to grow indoors. They're just one of many epiphytes (plants that grow on other plants) that don't have roots on the ground. Some types of ferns also grow as epiphytes, nestled high in trees in tropical Asia and South America. 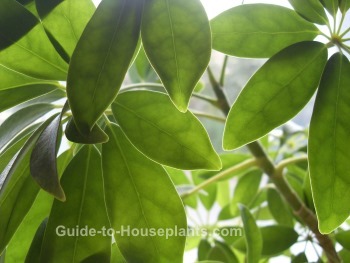 Schefflera hardly needs an introduction. 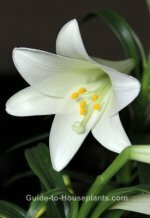 Easy to please, it is among the most popular house plants. And that's not all. Its pinwheel-style leaflets lend a lush, tropical feel to a room. Stunning all on its own, this tropical Australian native also makes a nice leafy backdrop for your indoor tropical house plant collection. Group it with bright bromeliads, sun-loving orchids in bloom or colorful croton. 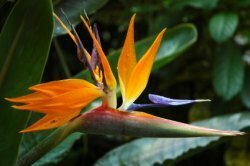 Not many tropical flower bouquets are without a Bird of Paradise (Strelitzia reginae) in all its splendor. It's slow-growing and can take a few years to bloom. When not in bloom, its large, leathery leaves look like a banana plant. Because of its need for high humidity and sunshine, this tropical beauty is not easy to please in most homes and grows best in a greenhouse. Discover more types of tropical flowers here. 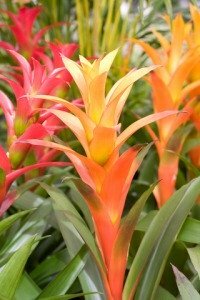 Discover the many types of Bromeliads you can grow indoors. This family includes captivating flowers... and they're easy to grow. Explore these rare tropical flowers. They're some of the showiest blooms you'll ever grow indoors...if you can find them.